Mikey Fuller | Interiors: Another peek into my kitchen. . .
Another peek into my kitchen. . . I tweaked the vignette next to my stove to include an antique candy mold I picked up at the flea market and added some aqua Ball jars my grandmother gave me to the ledge on my cottage style vent hood. For the tutorial on how to make your own vent hood like mine, click here. More revealed after the jump. Not much has changed since this graced the pages of Romantic Homes magazine in September 2011. I filled up the French wire vase with kitchen gadgets, added the small crock to store garlic, and topped it off with this fantastic candy mold I picked up at a local flea market. Here is a zoomed out view. You can also see where I put my collection of blue Ball canning jars on my vent hood. I love having the ledge of it to display things on. 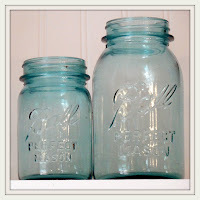 Okay blogging buddies, I haven't shared them yet, but I bought a rather large box of vintage French canning jars (oh. . .they were $5.00 for the box. . .I love estate sales. . .) like the Ball one above with the flippy metal seal. Do you know if I can get replacement rubber seals for this style of jar? I'd love to use them for storage, but the current ones are dry rotted! I'll leave you with a few more photos of the jars. Bead board + Ball Jars = Happy Kitchen! Don't fret, I'll be back soon with more goodies! Also check out my website devoted to my music, as I'm a pianist & organist, too, in case you didn't know!